A tortoise table roughly 30” x 18” with sides about 6” high. The table has enough area for tortoises to bask and roam, eat and a covered tortoise housing indoor area for them to hide and sleep. This will suffice, at least until your pets begin to grow out of it. A bag of tortoise bedding. Tortoises need fresh bedding to burrow in just as they would in the wild. A twin-pack of cuttlefish bones. Cuttlefish bones are an essential part of a tortoise’s diet. They need lots of extra calcium to keep their bones and shell growing properly. Place one in the tortoise’s home, float it in the water or ground it up over their food. A multivitamin supplement. Turtles rarely get the nutrition they need in captivity from their food alone. This will provide the missing essential minerals and trace nutrients that tortoises don’t get from their food. A 35 watt basking bulb to provide warmth just as the sun would. A sunlight UVA/UVB desk lamp that will keep your pet warm. Tortoises are cold-blooded animal that are used to living in hot environments in the wild. These lamps provide artificial sunlight essential for proper growth. Natural or artificial sunlight helps keep the bones and shell strong and helps the body absorb calcium. Tortoise food mix which will be the staple of their diet. This type of food contains dried plant and fruit pieces that are high in fiber and an essential part of a tortoise’s diet. Dried flower mix to be given as an added treat and supplement. The variety of natural ingredients will help encourage foraging behavior such as turtles will do in the wild. Spray cleaner that is 100% safe for your tortoises. 2 bowls for food and water. 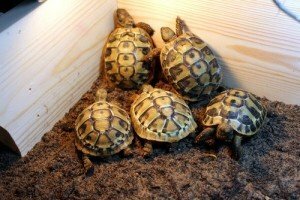 A booklet on how to care for your tortoises to keep them healthy and happy. Wire lamp holder that clamps on to the side of the tortoise table. Fiddlesticks toy for your pet to climb on or gnaw on. 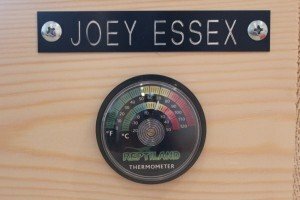 A thermostat to be sure your tortoise is kept in the proper temperature environment. You would easily pay a lot more for all this equipment if you bought it separately. 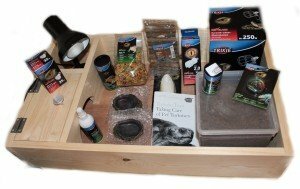 This starter kit ensures that you have everything you need to properly care for your tortoise. I hope this review helps you keep your pet happy for years to come!